I love a good pattern mixing outfit just as much the next fashionable girl, and I know I post about them a lot (here, here and here)…but when Megan and I showed up to showed up to shoot these photos with the same mixed pattern combination I knew it was something I wanted to talk about. And once I did a little more research (aka Pinterest stalking) I realized that we are definitely not alone when it comes to loving polka dots and floral print paired together! 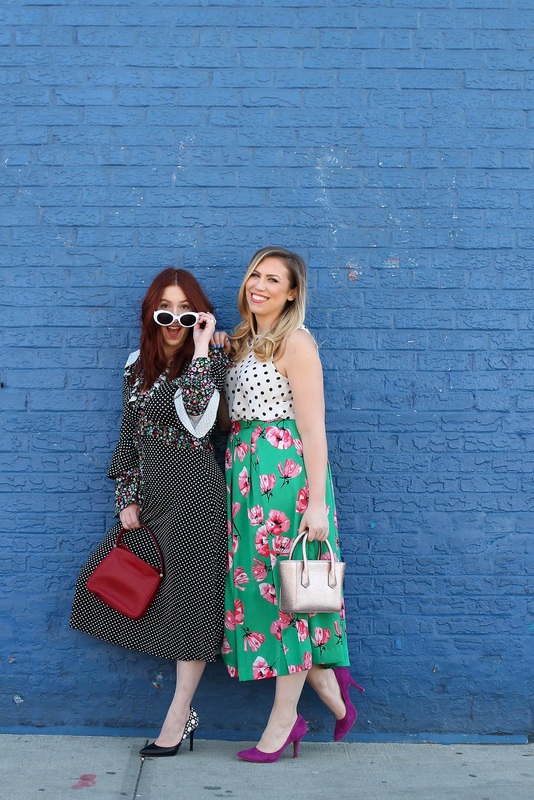 I love how different both of our polka dots and floral prints are! My outfit is definitely much louder and statement making considering how bold and bright my skirt is. My polka dot top is definitely still considered a print by definition, but I would consider it the neutral in this combination. And before you ask, yes, I do have 2 pieces in this green floral print (see the dress here!) While Megan’s outfit is definitely more muted and demure even though it has two distinct patterns. I love that even though we’re both wearing black and white polka dots paired with colorful floral prints we look completely different! This just goes to show you that pattern mixing outfits aren’t reserved just for ladies who like to stand out, it’s relatively easy to make an outfit like this more modest, especially if you take into consideration adding your second patter in the form of an accessory like a bag or shoe! I know some people are still leery about pattern mixing in general, so I’ll give you one bit of general advice that will make hopefully make it a little easier and less intimidating…Pay attention to pattern size! My outfit has two patterns that are larger in size, the floral print is big and the polka dots are big also! Megan’s outfit has prints that are on a much smaller scale, tiny polka dots paired with a much smaller scale floral! 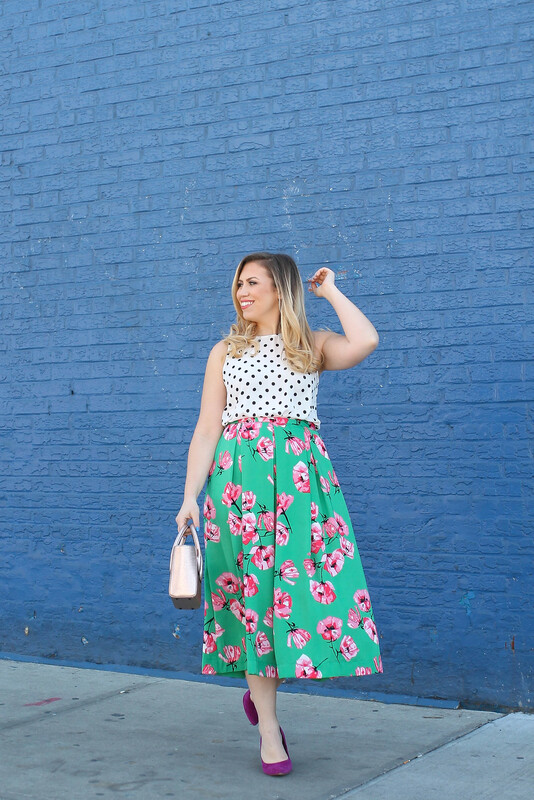 With that I’ll leave you with my current favorite polka dot and floral print items! Happy Mixing! Looking for more inspiration…check out our Spring Jeans, Spring Blues & Spring Layers Looks! And make sure to head over to Megan’s blog to see more photos of her outfit!